Giouvetsi (Greek Meat Stew with Orzo Pasta) | Simple. Tasty. Good. 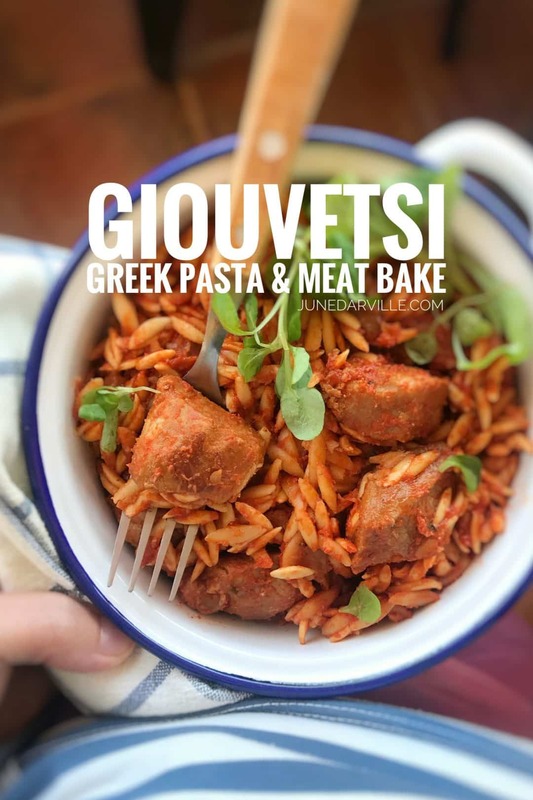 Giouvetsi (also spelled youvetsi) is a delicious classic Greek meat and pasta bake made with chicken, pork or beef but most commonly lamb. This dish takes quite a fair amount of time to simmer because the meat and pasta have to be super smooth and tender. But that’s exactly what makes it so scrumptious! 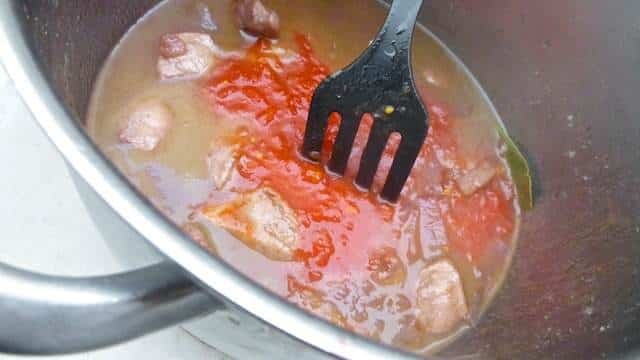 If you ever walked into a Greek restaurant before for lunch or dinner, then you also might have been given the chance to step into the kitchen and look into pans with simmering stews on the stove and salivate over pasta dishes in the ovens until you have found the meal that you want to eat. Because that’s how it goes in authentic Greek restaurants. Love it. Crazy about Greek food as much as we are? Well then, here’s your turn to make a big fat Greek food party at home! For the record: the cinnamon is crucial. Don’t forget it because it will make or break this dish, believe me. 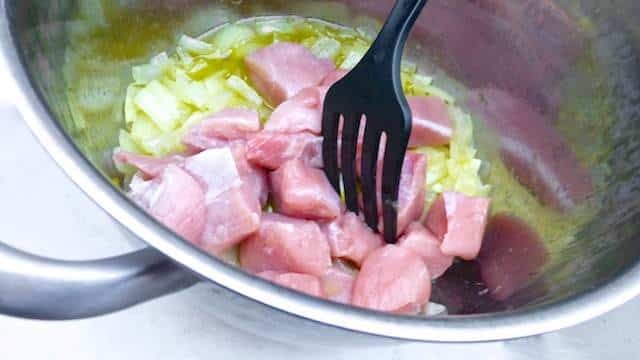 I got the inspiration for this giouvetsi dish from my Greek foodie friends Mirella and Panos over at Little Cooking Tips! Do you love Greek food? Then also check out another traditional Greek oven dish because I’m sure you will definitely know this one: my moussaka! Fried potatoes and eggplants with ground meat covered with a thick layer of bechamel sauce. Delish. Or maybe you are more into my chicken souvlaki skewers with tzatziki dipping sauce! I love a good pasta bake! But hold your horses, not just any type of pasta is used in this giouvetsi stew. Traditionally orzo is added to the meat stew. Orzo is small and shaped like a large grain of rice. It’s called kritharaki in Greek and you an also find it under the name of risoni. Can’t find orzo pasta? Then use a wider type of pasta like tagliatelle and break it into small bits. I was lucky to find orzo here in Spain. Had I not then I would have used the Spanish fideua that’s also used in paella. Looking for the KitchenAid Cook Processor recipe for this giouvetsi? Then scroll down to the second recipe on this page! Greek giouvetsi, an oven baked pasta lamb stew with orzo pasta! Pour the olive oil in a non-stick pan and place it over medium heat until hot. Then add the chopped onion and garlic. Stir for 4 minutes. Then add the diced meat. Season with pepper and salt. Stir and turn the heat up. Sear the meat on all sides until browned. Add bay leaves, clove and half of the wine. Cook for 1 minute. Then also add the chopped tomatoes and tomato paste. Stir well. Bring the tomato sauce to a boil and then turn the heat low. 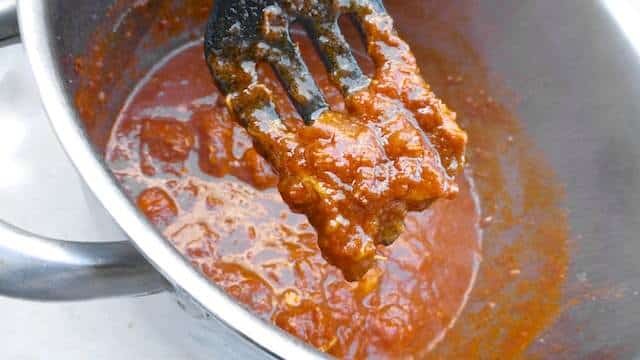 Simmer the tomato meat sauce for 1 hour until soft. Stir regularly. 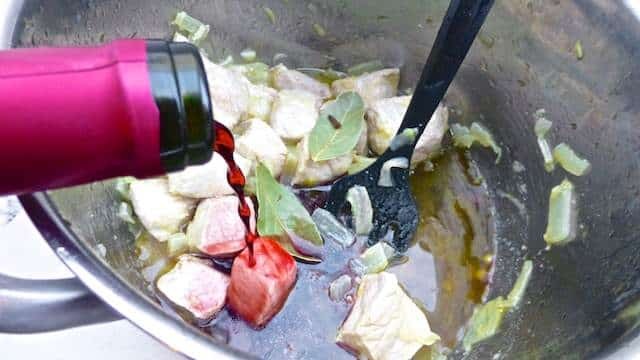 Gradually add the remaining red wine. Check the seasoning of the meat stew because you might want to add pepper or salt. Then also add the Greek orzo pasta and cinnamon. Stir well. Stir in the chicken stock and transfer it all to a large baking dish. Cover with tinfoil. Then bake the giouvetsi in a preheated oven at 400°F (200°C) for 20 to 25 minutes. The pasta will gradually absorb the liquid tomato sauce until it is tender. You should end up with a solid but moist tomato sauce. Remove the dish from the hot oven. Then transfer the pasta, tomato and meat stew onto plates. Serve hot. 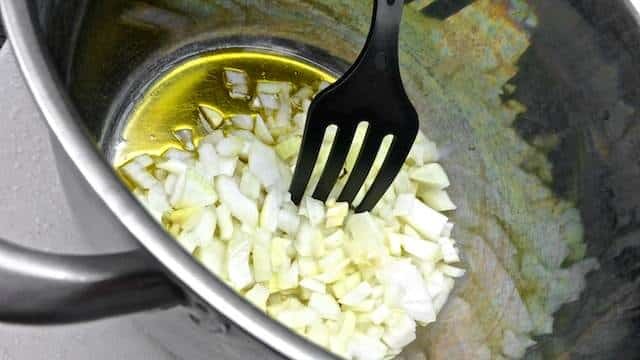 1) Add the onion and garlic to the bowl of the Cook Processor fitted with the MultiBlade. 2) Close the bowl and press Pulse for 5 seconds. Then remove the MultiBlade and add the StirAssist to the bowl. Scrape down the sides of the bowl. Then add the diced meat. Season with some pepper and salt. 3) Close the lid and select STEW P5. Press Start to activate Step 1. After that add the red wine, the bay leaves, cinnamon, clove and chopped tomatoes. 4) Close the bowl again. Adjust the cooking time to 1 hour (instead of 25 minutes). Then press Start to activate Step 2. Let the giouvetsi stew. Once the program is done, press cancel to exit the keep warm mode. Then check the seasoning of the meat stew because you might want to add pepper or salt. 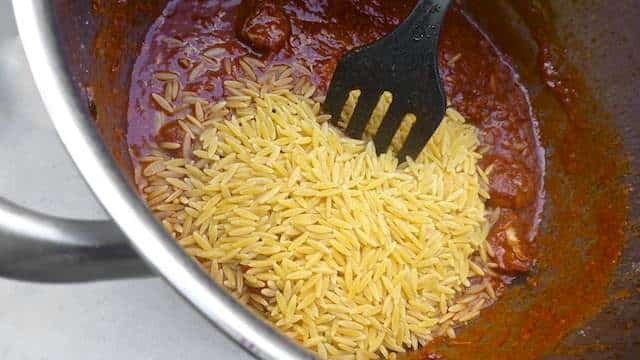 Pour in the orzo pasta. Now you can do 2 things: or give the stew a good stir and pour it all in a large baking dish. 5) Cover with tinfoil. Then bake the giouvetsi in a preheated oven at 400°F (200°C) for 45 to 60 minutes (this is the traditional way of cooking a giouvetsi). Or you can finish cooking the giouvetsi in your Cook Processor. Therefore select STEW P2 and press start. 6) The pasta will gradually absorb the liquid tomato sauce until it is tender. You should end up with a solid but moist tomato meat stew. Once the program is finished, press cancel to exit the keep warm mode. Then transfer the giouvetsi meat stew onto plates. Sprinkle with grated cheese and serve hot. Thanx so much for the plug dear June! 🙂 So glad that you liked it and recreated it in your own wonderful way!